How Long Does BLS Certification Last? The Basic Life Saving (BLS) certification is required by employers for many healthcare and medical-oriented professions. The BLS certification goes into more detail than standard CPR courses. Another bonus is that with so many healthcare professionals in one place, the group format allows for stimulating dialogue as well as reviews of CPR and lifesaving situations participants have experienced during their career. 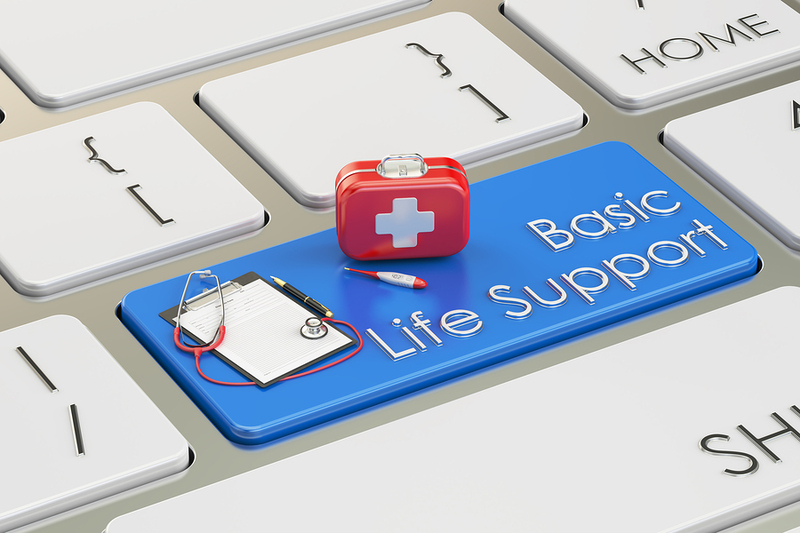 Many healthcare workers required to get BLS certification pair it with the Advanced Cardiac Life Support (ACLS) and/or Pediatric Advanced Life Support (PALS) for a more comprehensive certification set. Whichever route you go, the resulting BLS certificate is not a one-and-done, lifelong certification. Like all American Heart Association (AHA) and Red Cross-approved CPR, AED and/or first aid courses, BLS certifications must be renewed on a regular basis. How Often Do BLS Certifications Need To Be Renewed? Once you’ve passed both the written and active skills tests for BLS certification, you are issued an official card that is valid for 24-months after the date printed on the card. The date listed is typically the date you passed the written and hands-on tests. While many employers offer corporate CPR courses, streamlining the process for their employees, it is ultimately up to the cardholder to renew their certification in a timely manner. We suggest putting a reminder in your digital calendar for 60-days prior to the date of your BLS certification expiration date. This way you have plenty of time to find a renewal course near you so you can renew the course before your card expires. Not only does this keep the information fresh in your mind, it also ensures you don’t run into any problems with HR and/or with prospective employers. View Initial BLS for Healthcare Provider Classes taking place in and around the Richmond, VA and Raleigh, NC areas. What Is The Grace Period On BLS Certification Renewal? Has your BLS certification recently expired? You may still be in luck. There is a 30-day grace period that begins after the expiration date. During this period, BLS certification cardholders can still enroll in a recertification course, rather than having to take the first-time BLS certification course again. However, this is only applicable as long as the course is completed (and the test is passed) before the 30-days have elapsed. If you are past the 30-day grace period, you’ll need to enroll just as you did the first time, in a full-length, initial BLS certification course. Unfortunately, there are no exceptions to the rule. Again, calendar reminders are invaluable for ensuring busy healthcare professionals remember to complete their BLS recertification before it expires. How Do I Renew My BLS Certification? If you are ready to renew your BLS certification, and you’re within the expiration date and/or the 30-day grace period, you’ll enroll for a BLS for Healthcare Providers Renewal course. These courses are typically much shorter than the course designed for first-timers. While the content may vary slightly depending on the instructor, experienced BLS attendees are able to move through the materials review and hands-on practice opportunities, more quickly. In most cases, a renewal course takes about four to five hours, whereas the first-time BLS certification course lasts an average of seven to eight hours. Review a list of upcoming, AHA-approved, BLS For Healthcare Provider Renewal Certification here in the Richmond, VA and Raleigh, NC areas. Many adults enjoy the online certification opportunities offered by the American Heart Association and others. However, even after you’ve taken the online classes and passed the test, you still have to schedule an appointment with an approved, certified instructor in order to pass the active, hands-on skills test. Thus, the online courses may not be as convenient after all. We recommend attending instructor-led courses whenever possible, especially if this is your first time taking the BLS certification class. Online courses do not offer the same variety of materials because the track has already been laid. In contrast, attending BLS certification classes in person provides the opportunity to ask more questions, not to mention hear and share the real-life scenarios healthcare professionals like yourself encounter on a daily basis. In addition to the ability to complete coursework and tests, as well as participate in hands-on learning and simulations in the same session, the collaborative format of the courses makes for a more rich and interesting experience. Most instructors agree online courses are better-suited for those who are renewing their certification rather than for those obtaining their initial certification. Check out, Can You Take a CPR Class Online, for more information on the topic. If your employer requires BLS and/or other CPR/AED/First Aid certifications, talk to your human resources department about offering certifications in-house or bringing them to an accommodating, nearby location. On-site courses are more convenient and affordable for everyone involved, including your employer. CPR Consultants’ instructors are happy to bring the BLS class, and other certification courses, right to your brick-and-mortar business. This makes it easier than ever to ensure employees have the certification(s) they need, in a timely manner, and without having to worry about expiration dates. Ask your HR department, management or relevant personnel director to contact CPR Consultants. What is a PPE and Why Are They Important?